Grab your favorite cartridge and violently blow into the end, because [Dave Nunez] is sending us on a nostalgia trip with his 3D printed portable NES. He takes the typical route of chopping up a Nintendo on a chip (NOAC) retro machine rather than sacrifice a real NES, and opts for a NiMH battery over lithium (which isn’t a bad idea; they can burst into flames if you charge them incorrectly). The battery life is, however, tolerable: 2.5 to 3 hours. All the components are packed into a custom-made 3D printed PLA enclosure, which [Dave] kindly shares on thingiverse. He also decided to 3D print each of the buttons and their bezels/housings, which he then topped off by cutting acrylic sheets that seal up the front and back. As a final touch, [Dave] slips in some custom art under the acrylic and mounts a printed LED nameplate in the corner. 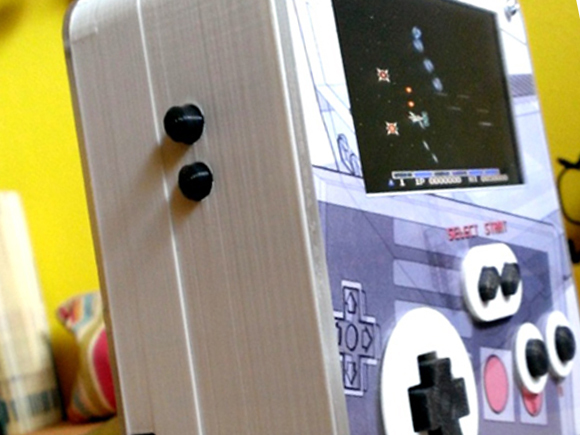 We’ve seen [Dave’s] work at Hackaday before, when he built a one-size-fits-all-consoles arcade controller. I wish people would stop spreading anti lithium battery paranoia. Lithium-ion charging ICs are very cheap and simple, and if you’re really worried, you can get cells with built-in protection circuits. heh yer right bout that. been usin li-ion fer years an’ no troubles. And yet flashlight forums are full of explosion stories. Why bother with special charging- and protection circuits if NiMH does the trick just as well? A quick glance and I didn’t see anything about adding a protection circuit… Specifically, one to keep the drill from draining the battery below safe levels (Remember: Overcharge can be as dangerous as Undercharge in Lithiums). ALWAYS respect lithium batteries. When this kid’s drill batteries were NiCd, he could leave them wherever he wanted, whenever he wanted. Now that they are LiPo, he needs to keep them in a safe place such that if the battery decides to catch fire (HAPPENS ALL THE TIME), they won’t burn his house down. Also… This is not a hack. This has been done a thousand times over with various types of cells and is posted all over the internet. Can you guys please change the name of this website to something more accurate? Project-a-Day? VERY strange… Commented in the Drill Battery replacement writeup, and it ended up here??? Dont forget overcurrent draw protection. All of the drills I have used will shut it down if you draw too much current from the battery.